A Newbery Honor-winning biography of the men whose experiments brought about the Age of Flight. This engaging narrative account of Orville and Wilbur Wright, two men with little formal schooling but a knack for solving problems, follows their interest from a young age in the developing field of aeronautics. Russell Freedman's writing brings the brothers' personalities to life, enhancing the record of events with excerpts from the brothers' writing and correspondence, and accounts of those who knew them. Chronicling their lives from their early mechanical work on toys and bicycles through the development of several flyers, The Wright Brothers follows the siblings through their achievements-not only the first powered, sustained, controlled airplane flight, but the numerous improvements and enhancements that followed, their revolutionary airplane business, and the long legacy of that first brief flight. 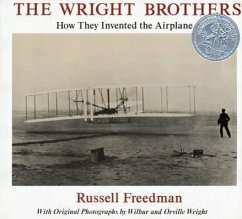 Illustrated with numerous historical photographs-many taken by the Wright brothers themselves-this is a concise, extremely reader-friendly introduction to these important American inventors. Includes a note on the Wright brothers' photographs, as well as recommendation for further reading and learning. Russell Freedman (1929-2018) transformed non-fiction for children through his insightful narrative, comprehensive research, careful selection of photographs, and deep understanding of his subject matter. He was well known for his riveting biographies and masterful accounts of the history of the United States. One of the most honored writers for children, his many awards include the Newbery Medal, three Newbery Honor Medals, the Laura Ingalls Wilder Award, the May Hill Arbuthnot Honor Lecture Award and a National Humanities Medal. Major works include Freedom Walkers; Lincoln: A Photobiography; Because They Marched; The Wright Brothers: How They Invented The Airplane; Vietnam: A History of the War.